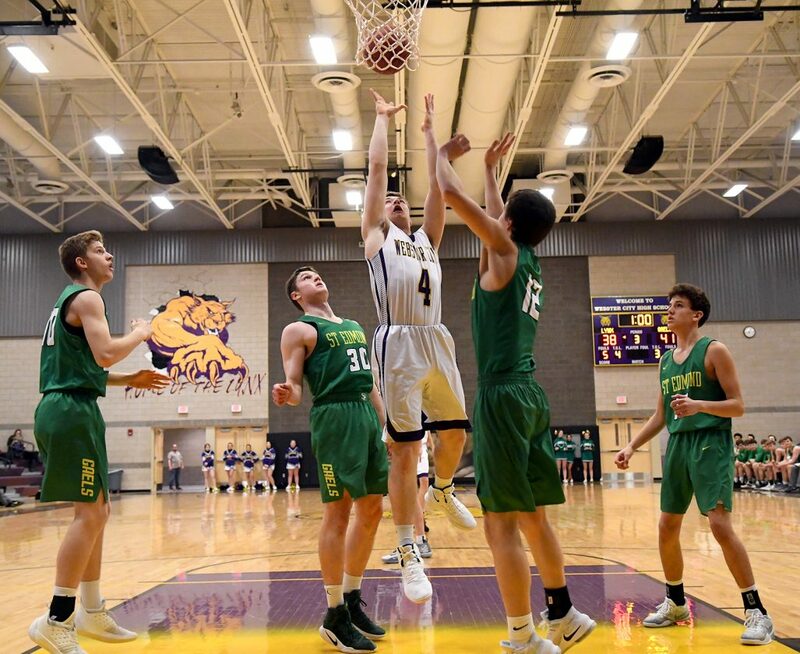 WEBSTER CITY — Boisterous and brash are not words ever associated with Dylan Steen, so it came as a surprise to everyone inside the WCHS gymnasium when he was whistled for a technical foul midway through the third quarter Monday night. Steen felt awful about his momentary lapse in judgement and he knew he had to do something to make amends. 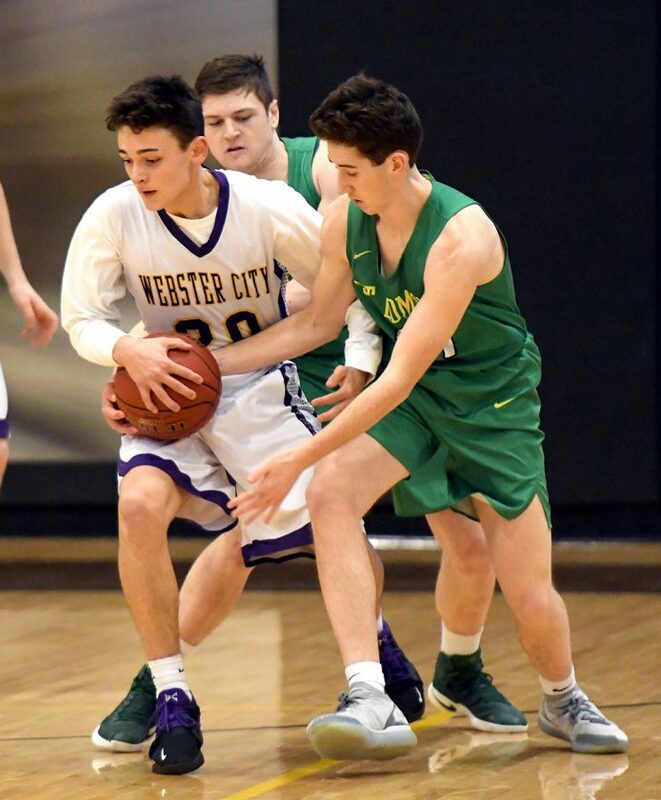 Steen rattled in back-to-back 3-pointers early in the fourth to slice into a two-possession deficit and then hit the game-winning shot with five seconds remaining to lift WCHS past St. Edmond, 59-57, in a North Central Conference clash. How Steen was able to bury the game-winner was just as surprising as the technical. St. Edmond (9-9, 7-6 NCC) overcame a nine-point deficit with 2:20 remaining and knotted the game at 57 with 12.6 ticks to go. 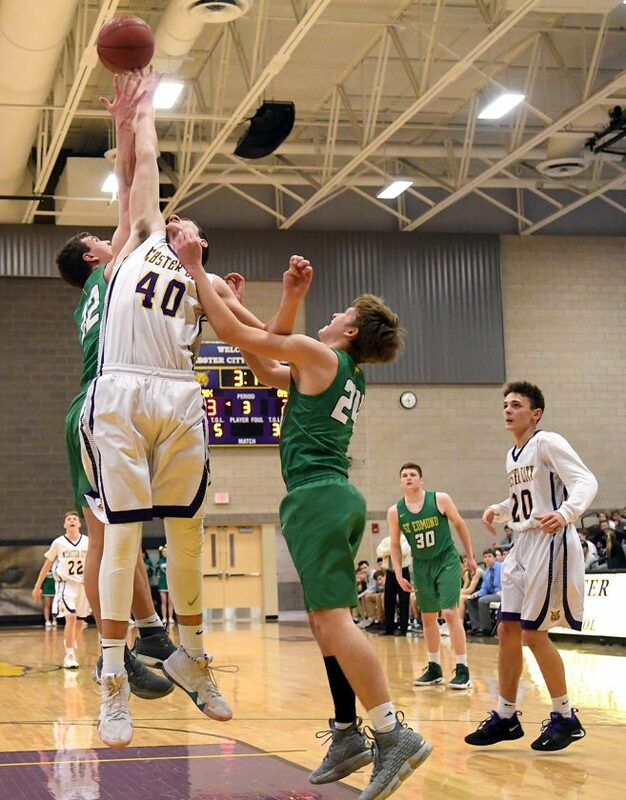 Andrew Gibb, who scored 12 of his game-high 31 points in the fourth, was fouled on a 3-pointer from the wing and he calmly buried all three foul shots. But rather than call a timeout to set up a play, WCHS head coach Marty McKinney opted to let it play out. 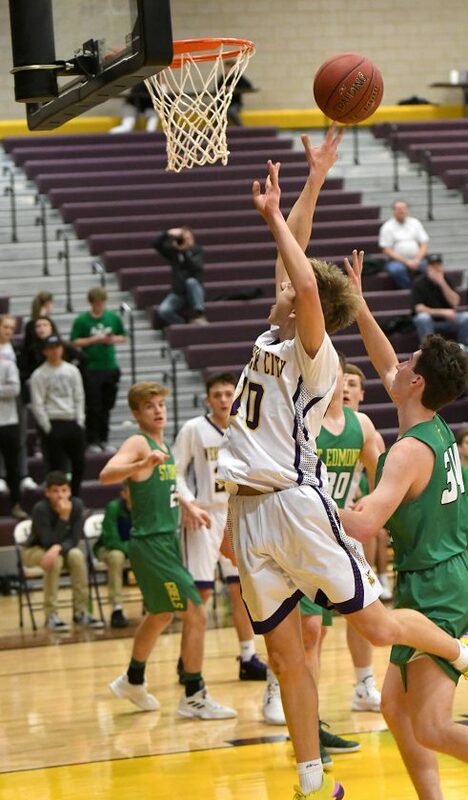 Steen eventually got the ball near the St. Edmond free throw line and as he looked up-court he quickly realized there was nothing but wide open real estate. Steen took the ball uncontested all the way to the basket and laid in the game-winner. He made McKinney look pretty smart in the process. Henry Hoversten led WCHS (12-6, 9-3 NCC) with his ninth double-double — 17 points and 13 rebounds — of the season. He also came up with three steals. Tyler Olson and Tavis Eklund added 13 points each. The back-and-forth battle featured one run after another. WCHS opened a 10-3 lead early, only to watch St. Edmond score 12 of the final 16 points of the first quarter to claim a 15-14 advantage. A 7-0 Lynx run in the second, as well as a trio of 3-pointers from Eklund, enabled them to open up a 29-23 lead at the break. WCHS led by eight early in the third when St. Edmond embarked on a 15-2 spurt that gave it a five-point lead. The Gaels were in front 41-38 as the fourth quarter began. Steen got the defensive assignment on Gibb, and at times he was able to limit the conference’s leading scorer at nearly 29 points a night. But Gibb scored in flurries, particularly in the fourth when he rattled off nine consecutive St. Edmond points to close the gap. Did Gibb perhaps get under Steen’s skin? Actually, Steen says he enjoyed the challenge. “He’s one of my favorite people to guard because he’s probably the best player in the conference,” Steen said. Jackson Kochendorfer added 14 points for the Gaels. He canned four 3-pointers. After playing some of its best basketball of the season in recent games, McKinney admitted his team wasn’t quite as sharp as he would have liked. But he also knows that’s going to happen from time to time. “When you win on nights where you’re not your best, sometimes you feel fortunate,” he said. WCHS hosted Humboldt last night. It will be back at home again on Friday to face Algona. St. Edmond (9-9, 7-6 NCC) — Connor Bocken 0 0-0 0, Mitchell Rasmussen 0 0-0 0, Jed Tracy 2 0-0 4, Drew Schaeffer 0 0-0 0, Andrew Gibb 9 10-12 31, Sean Newell 3 1-1 7, Jackson Kochendorfer 5 0-0 14, Cael Kolacia 0 1-2 1. Totals: 19 12-15 57. Webster City (12-6, 9-3 NCC) — Dylan Steen 6 1-2 15, Drake Doering 0 0-0 0, Nathan Ferrell 0 0-0 0, Tavis Eklund 4 1-2 13, Tyler Olson 4 5-6 13, Carter Neuroth 0 1-2 1, Henry Hoversten 6 5-7 17. Totals: 20 13-19 59. 3-pointers — SE 7 (Kochendorfer 4, Gibb 3); WC 6 (Eklund 4, Steen 2). Rebounds — WC 26 (Hoversten 13, Steen 5). Steals — WC 6 (Hoversten 3). Assists — WC 8. Turnovers — WC 15. Team fouls — SE 20, WC 13. Fouled out — none.